The great dilemma for the panamerican cyclist is how to negotiate the Darien Gap, a land thick with jungle, rivers, mountains, drug runners, and militant groups... The road stops just short of the Darien jungle and picks up again in Colombia. Some intrepid cyclists - actually just one that we know of - have traversed this section by foot carrying their bikes, but this was several decades ago before guns became more common than machetes in this part of the world. 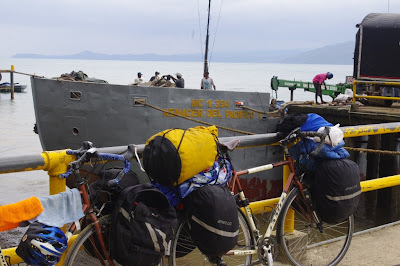 We opted for a boat ride, or rather series of boat rides that would take us from town to town along the Pacific Coast, and back to the road system in Colombia.